Wowzers! Four awards have been sitting in our drafts(some for far too long). Thank you much to four wonderful blogs for the nomination: Sistergeeks.net, inklingstime.wordpress.com, Shihtzubookreviews.wordpress.com, and vinnieh.wordpress.com! We decided to make one post for the four awards so we wouldn’t bore everyone with the same questions on four separate days. So to keep this post more original, we decided to write our backstory for you all. For those of you who don’t know Aaron and myself, this is how our life together started. I (Jonathan) was 19-years-old and a sophomore in college. I was working two jobs: I was a receptionist at Pet’s Suites which is a kennel for dogs and cats/grooming, and I was working for 24 hour fitness in the Kid’s Club. I had gone through a deep depression and I gained a bunch of weight. I finally came out of the closest and when I did a huge weight had been lifted off my shoulders. I lost 85 pounds in a month and a half. Crazy weight loss! I was just motivated to change my life and spent my days at the gym, school, and writing. I actually lost more weight than I had intended to and because of it, my body was weak and I had to go on special shakes to gain weight. I also had shell fish one day and got an allergic reaction. I was rushed to the ER. When I got home that night, I was on the computer talking to this guy on Myspace named “Vansboy”(Aaron). I had stumbled upon his profile, but I was intimidated. He had over 10,000 followers! I was sure he wouldn’t respond to me, but there was something that drew me to him. I shot him a message still nonetheless. To my surprise, he emailed me back! We started talking on AIM, and gradually transferred to the phone. I actually printed out our original conversations on Myspace so we can look back and see how embarrassing we were nearly nine years ago. I had just come out of the closet and wanting a relationship because I never had a boyfriend before. Aaron let me know right away that he wasn’t looking for a boyfriend because he was trying to work on himself. He had just got out of high school, was a freshmen in college, and just got over being really sick for six months straight. Little did I know, Aaron was putting up a front. He told me later he wanted a boyfriend but was just tired of dating and decided to stop “looking”. Anyways, we flirted for about a month on both the internet and phone until we finally decided to meet up. I picked him up one day from his house and we drove around for about an hour. He asked me if I wanted to meet up with his best friend Jill at the mall. I said yes, but I took that as a sign he was bored. So we ended up spending the rest of the day with Jill. When I dropped him off at home I was pretty certain he really just wanted to be friends. Yet again to my surprise, Aaron asked to hang out on a date! I picked him up and we went out to dinner at the restaurant Jill worked at. While we were there, our waiter (Jill) comes up to us and tells us that Aaron’s entire family is in the booth across the room! All of them! His mom, stepdad, and two little brothers. Mind you this was our first date! My first real date with a guy!!! I wasn’t ready to meet parents! Aaron was embarrassed because his family had never met anyone he had dated before. I wanted to slip out of the back. But there was no door. Aaron ended up introducing me. His family is great so it was totally fine. I’m not even sure they know about that story. Later we ended the night with a make-out session in my car (ah, young love). You want to know how it ended….with his mom pulling into the driveway, her light flashing at us lip-locked! To this day I’m not sure if she saw us. The next morning, I woke up with butterflies in my stomach. I wanted Aaron to be my boyfriend, but I was too scared to ask him after he told me he didn’t want a boyfriend. So, there I was waking up that morning, heading straight for my computer to see if Aaron had sent me an email. He did! He asked to be officially together. 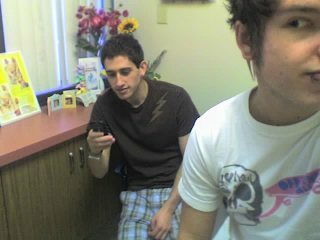 Our first official date, as boyfriend and boyfriend, was at a doctor’s office, but that’s a whole other story. Three months later, Aaron and I moved in with my best friend (Victoria) who was living in a three bedroom house with her boyfriend and his friend. We lived with them for almost two years, then we all went our separate ways. We moved in with a friend from work after that who ended up skipping out on the last month rent, and stealing $300 from us and some of our stuff. (We haven’t spoken to her since). After a year together, on our exact anniversary, Aaron and I became domestic partners and Aaron took my last name. On October 2013, after a lot of career changes, 7 apartment changes, me getting published with Dragonwell Publishing, we tied the knot. If there is one thing I’m confident in this life, it’s that Aaron and I are quite the team. We love each other very much and spend every chance we can together. That includes this blog which we started about 6 months ago. We began Husband & Husband to share our love, inspire change in the world, express our art, and help those we can.